When you’ve got little kids, you tend to pack heavy so you can be prepared for the unexpected. 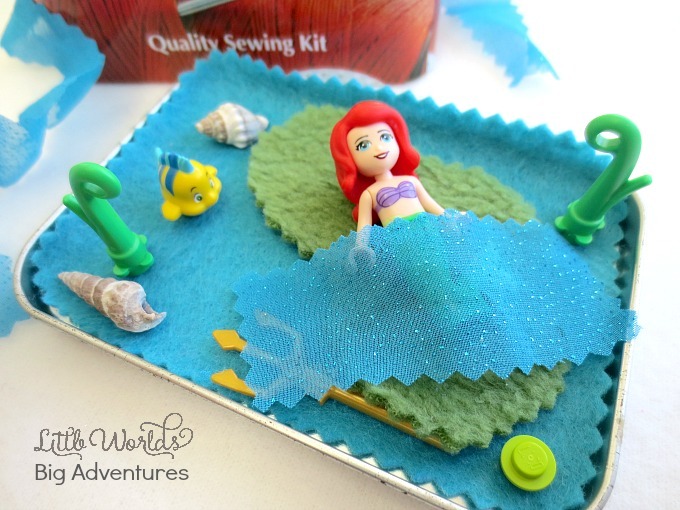 This little mermaid travel tin is about to go on your list of things to take! It is small world play at it’s cutest and just perfect for entertaining your kids when you are on the go. I know it’s not only me who spends a lot of time waiting for school pick ups or at hobby’s, the doctor, bus stop, bank, restaurants and so on. From now on you will have another little trick up your sleeve to get you through the next 15 minutes. You’re welcome! 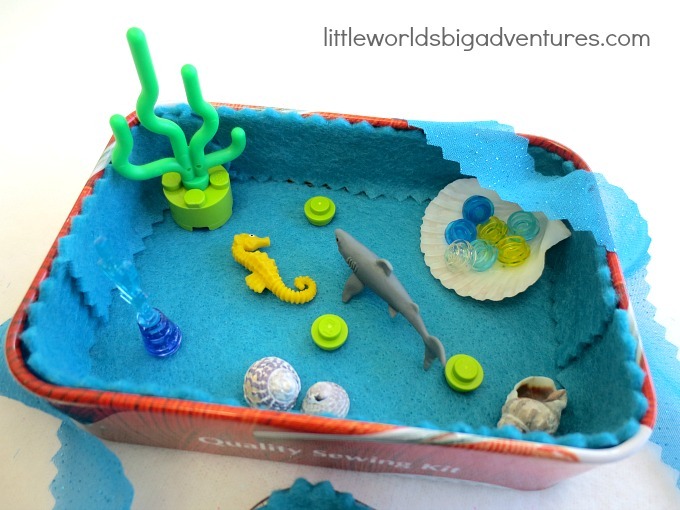 Read on to see how we put together our mermaid travel tin. Feel free to grab some tips and apply it to a travel tin with a theme of your choice! 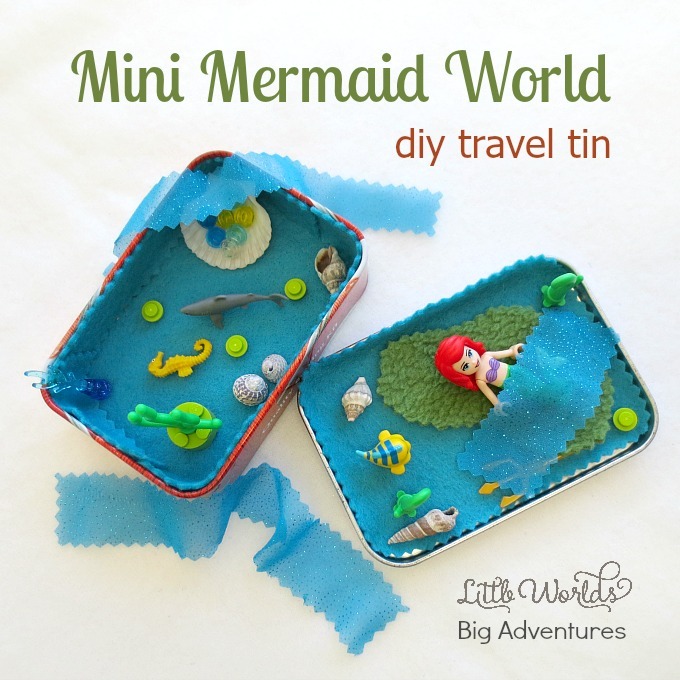 There are only a couple of steps to making this adorable mermaid travel tin. 4. Add some fabric scraps for the bed, seaweed, waves, … make it up as you go along! 5. Add loose parts such as Lego or Playmobil, seashells, Safari Lucky Charms, … whatever you can get your hands on! Besides choosing the theme of your own diy travel tin, you can also choose to make it yourself and surprise your kids OR turn into into an activity to do with them. Either way, they’ll love their new toy! This craft activity has got to be one of my favourites because it combines a lot of elements I truly love: a good diy project, small world play and loose parts. Should you be looking for some more inspiration in those departments? Then stick around and have a look at previous creative mommy projects, check out our amazing small worlds and learn all about the theory of loose parts and how to make it work for you at home. And by the way, in the mean time we have made a mini dinosaur travel tin AND a toy car travel tin, which you should really check out because they are amazing!